JASPER - Cannon County's backcourt duo of Cory Henley and Jarrett Melton provided the bulk of the offense as the Lions powered past Marion County, 87-77, to notch the road win here Friday (Nov. 18). Henley poured in a career-high 30 points and Melton finished with 16 points, six assists and six steals to help lead the Lions (1-1). Though Henley and Melton were responsible for a high percentage of the scoring, several Lions contributed to the win. Eleven different players scored. Ethan Bryson finished with eight points and Brad Hutchins was strong with seven points and five rebounds. Tanner Larson had six points and yanked six boards and Adam Davenport also netted six points. Cannon County's bench was a big factor in the outcome. The reserves were responsible for 28 points, led by Hutchins' seven. "It is a nice win and I'm proud of the effort, but we have a lot to improve," Cannon County Head Coach Matt Rigsby said. "We showed composure and that's a good thing to see early in the season on the road with an inexperienced team. We had a lot of guys contribute and that was a big part of the win." So was a strong performance from the charity stripe. The team's combined for 89 free throws (Cannon County 56, Marion County 33). The Lions connected on 41-of-56 of their attempts for 73 percent. They were at their best when it mattered most. The Lions knocked down 9-of-12 free throws in the final minute, including 4-of-5 in the final 30 seconds to seal the win against a scrappy Marion County squad. Henley and Melton scored 13 of the team's final 14 points during the final 2:37. Marion County had closed to within four, 73-69, with 2:11 remaining, but Henley answered with two free throws to push the lead back to six. Marion County cut the lead back to four and Henley answered by making 1-of-2 charity tosses to extend the lead to 76-71 with 1:52 remaining. That's when Melton sealed the deal. The junior guard cut into the passing lane for a key steal and subsequent layup to push the lead to 78-71 with 1:17 remaining, taking the crowd out of the game and slowing Marion County's momentum. Melton scored five straight points during the stretch and six of team's final 11. "We still had a lot of turnovers (29)," Melton said. "It was sloppy but we got it done. We shot a lot better from the free throw line (than at Cumberland County), and we advanced the basketball better in transition. The big thing was hitting our free throws and taking care of the ball late. There were not too many turnovers there at the end. It's just a matter of taking care of the basketball." While Melton left his mark at the end, Henley did damage throughout. Henley's most extensive blows were landed in the pivotal second quarter when he sparked an 18-0 run to close the half with an array of long-range daggers combined with layups in transition. Cannon County was clinging to a slim 32-28 lead with 3:53 remaining in the first half. The Lions defense clamped down and Henley ignited offensively, scoring 10 of his game-high 30 in the final two minutes to send the Lions into intermission with a whopping 50-28 advantage. 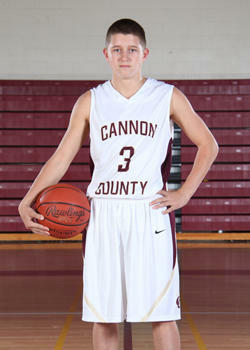 Henley's long 3-pointer provided Cannon County's largest lead, 38-28, with two minutes remaining. He added another trey with 49 seconds remaining and closed the half with consecutive layups, the final one coming with two seconds on the clock. "The more we play and gel as a team, the better we will be," Henley said. "We did a better job of knocking down free throws in the end. We didn't want to lose after working hard to build that lead so we stepped up and got it done." Marion County put together its own run and got to within four twice in the final 2:37 but the Lions showed composure and made key plays down the stretch.